"My mom was from the 'boil the ever-loving crap out of everything' school of cooking. Carrots boiled to sad orangish lumps. Broccoli steamed beyond any recognition. Corn may have started fresh but by the time she was done with it, it resembled creamed corn but lacking any possible flavor or texture. BBQ chicken? 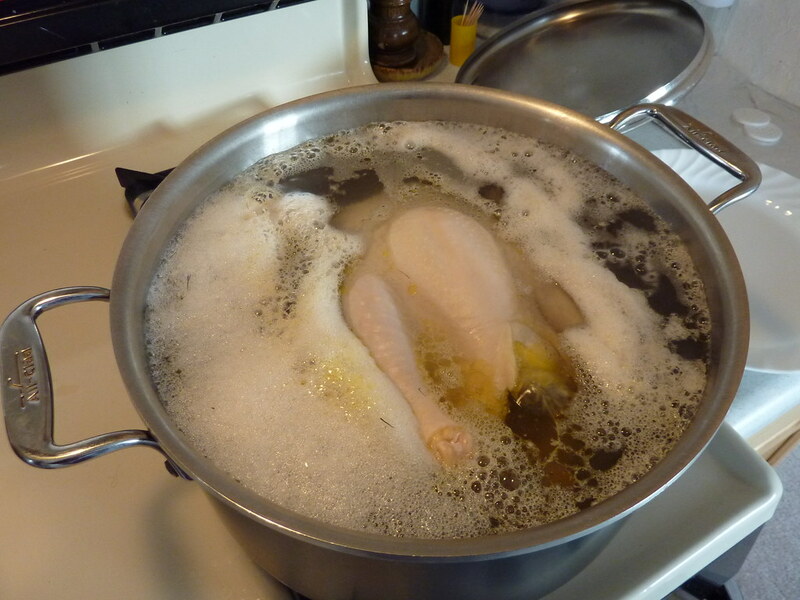 Boil that mother clucker COMPLETELY before you blacken it on the grill, lest you and everyone you love die horrifically from salmonella. The things she would do to a steak are crimes against humanity. Combine all this with an '80s desire to avoid salt at all costs, and my dad's pathological fear of bad breath resulting in a blanket household ban on onions and garlic, and mealtime was a grey-ish, disappointing place. I now take cooking very seriously." "Poison Ivy sandwiches. Because mom read a theory in one of her new agey magazines that you could reduce sensitivity by eating it. My sister and I complained to dad when he got home from the field (Geologist) and it never happened after that. I believe words like 'Are you freaking insane???' were used." "My mom liked to make spaghetti. 'That's not weird!' I hear you say. Let me mention that she made it with raisins. Like, get a pot of water boiling, throw in the noodles and some raisins at the same time. No spaghetti sauce afterward, just cooked spaghetti and rehydrated raisins on a plate. She was very proud of this dish and didn't understand why we hated mom's day to cook." "I am allergic to, among other things, bananas. This has progressed since my childhood, from 'bananas make my mouth itchy' to having trouble breathing if I occupy the same space as a peeled fresh banana. It also just so happens that my mom's favorite fruit is bananas. She knows I am allergic to bananas, and that I have (had) an EpiPen because of how severe my allergies are. Last summer she offered to make me a strawberry smoothie. She used a particular kind of frozen strawberries that I am not allergic to, so I accepted because it was really hot outside. I headed into the living room and chilled out while I listened to her fire up the blender and make the smoothie. When she handed me the glass, I took a tiny sip and immediately I felt my throat close. I didn't stop breathing, but breathing became very uncomfortable and I couldn't swallow, so I chugged some liquid allergy medicine and collapsed onto the couch with my EpiPen in hand should things get any more serious, and basically wheezed for 30 minutes while I waited for the medicine to work. Once I could speak properly again, I asked her what she put in the smoothie. She admitted that she hid a half a banana in the smoothie because she thought that if I didn't know it was there, then I wouldn't react to it. Needless to say, ever since I have watched her like a hawk if she prepared something I was going to eat, and mostly just made all of my own meals. Some parents just don't understand how allergies work." "At Some Point Frugality Becomes A Mental Illness"
Boiled water with pepper and paprika. At some point frugality becomes a mental illness." "My mom also makes this thing me and my brother can only refer to as 'compost salad.' It starts on a skillet where she scrambles some eggs. Then, she adds 3 cups kale and steams it, often times burning the eggs in the process and releasing a vaguely fart like scent into the atmosphere. Then, it gets weird. She adds an entire can of kidney beans (bean water and all), mashing them into the eggy kale. She then adds cinnamon, nutmeg, curry powder, garlic powder, and salsa and Tabasco sauce. At this point, the smell is so nauseating it's nearly impossible to be in the same room as this abomination of a dish. After it's done being heated into a mush, she puts it on a plate and adds vanilla yogurt on top. Looks like it was fished straight out of the trash. Needless to say, I refuse to let her make me food. And by the way, I really have no idea what's wrong with her, but something is definitely up if she thinks that this is an acceptable meal." "Bologna sandwich with mayo, on Iron Kids bread. Doesn't sound too horrible, right? Except that I ate this same sandwich every Monday through Thursday for lunch, for three years of grade school. On Fridays, I got a treat: a tomato sandwich with mayo and salt, on Iron Kids bread. It got to the point I would be faking illness to stay home from school once in a while, just so I could find anything else to eat for lunch. I only finally stopped getting bologna sandwiches in the fifth grade, when I started to bring my lunch bag home with the sandwich uneaten. I had already been giving it away or throwing it out for months. My mom got pissed that I was wasting the food. Two years of asking for any different kind of meat fell on deaf ears, but less than a month of wasting the sandwich got her attention. To this day, 23 years later, simply smelling bologna will make me start to heave." "My mom, God bless her, was not a very talented cook. She tried, but she just wasn't interested and didn't have the knack. At least I got a home-cooked meal most nights, so I can't complain. I lived in fear of 'bratwurst' my whole life until I was in college. There was a German festival and all of my friends were like, 'Oh boy! Let's go get some brats!' I thought they were crazy. Then someone handed me a real brat on a bun with spicy mustard and sauerkraut and I realized that I had been all wrong about the true nature of bratwurst. That was probably the best thing I learned in college." "My mom was/is seriously the worst cook. The only time I ever ate anything good was when we had weekends with my dad and he took us to restaurants and let us order whatever we wanted. For a kid, I could eat a lot of lobster. My mom made these disgusting casseroles with fried spam, Velveeta mac n' cheese and canned peas. Then it was topped off with those Kraft singles slices and crushed up bbq potato chips. She thought that was the ultimate in cooking. I still feel sick when I think about it. Sometimes for dinner we would have chipped beef on toast which is a disgusting salty great depression kind of food. And if it wasn't chipped beef it was some kind of soup/tuna mixture over toast. If it came in a can, we probably ate it. This is probably why I taught myself how to cook. I went back home to visit last year and I cooked dinner every night because I saw my mom pulling out the Spam and Velveeta and there was no way I was going to let that happen. My dad didn't want me to leave after the fourth salted caramel apple pie I made." "My mom used to try and get me to eat a Filipino dish called 'dinuguan' which literally means 'blood' in English. It's a type of pork stew with pig's blood as the sauce. It's completely black. She used to tell us it was 'chocolate soup.' I did not believe her, and I don't know if my brother did, but he ate it anyway." "Not my parents, but my grandmother. She made a dish she called 'hamburger soup.' It wasn't so bad the first time, but she would freeze the leftovers in a zip lock and the next time she made it she would unfreeze them and add to it. She did this for years. I got sick every time she made me eat it, to the point I would violently throw up and have diarrhea for days. She also made 'ketchup soup' which was a pot filled with water and enough ketchup to flavor it. She would then serve it with venison that came directly out of the freezer then was thrown in two inches of oil to fry it. After I was old enough to leave for dinner I would. If I waited until grandpa had to go into town, he would stop by Burger King and buy a few whoppers, a couple to eat right then and a few to hide them in his truck for later. Would then go out to feed the cows and eat cold whoppers that sat under his truck seat all day. Still better than grandma's cooking." "My grandma made leftovers casserole while my mom was growing up. You take a bunch of cooked noodles, whatever leftovers seem appropriate, add a can of cream of something soup, throw a topping on it, and bake it till it's food. My mother hated it. She called it One Pot Glop. Grandma made it at least once every time we visited, and I LOVED it. Once when I saw her cooking it, I cheered, "Yay! One Pot Glop!" The look of betrayal on grandma's face was very confusing. I made One Pot Glop for breakfast this morning." "My step dad and mom used to make "grilled cheese" for lunch every weekend. Now, that's not so bad, right? wrong. Bread with the knock-off kraft processed cheese, microwaved for 2-5 minutes. No butter. No toast. Just soggy bread and burnt plastic cheese (if only in for 2 minutes). If it was cooked for 5 minutes, the bread would be rock hard and molten plastic." "A dry ketchup sandwich. It was old stale bread that was broken in half for the two pieces of bread for a sandwich with ketchup in between them. No meat. No cheese. Just ketchup. If we were lucky, the bread wasn't too stale and the taste kinda resembled french fries." "My mom would mix cooked mac and cheese with applesauce in a bowl and give it to us." "When they were younger, my grandma and her siblings were forced to eat cream of mushroom soup sandwiches. Her dad would slice the soup like cranberry sauce and spread it across the bread." The cider in question was cheap-as-dirt White Lightning (the only time we actually bought it, I'd like to point out) and me and my sister hated it. My mum was awesome as we were growing up and, in all fairness, we did eat most of the things anyway as she was a fantastic cook. But this was an abomination beaten only by liver and onions. She stopped making it when I went to school hungry (I'd gotten up too late to get breakfast) and the school phoned her up to express their concern and make sure there was nothing happening at home." "My stepdad loved Grillades but he made them the old fashioned way. Chicken gizzards and livers cooked in a gravy and served over rice. The gravy and rice was good but I couldn't stomach that meat. And then there was Maque Choux which is basically corn soup. Nothing particularly gross about that except I really hate corn." 1) Instant mashed potatoes with mayonnaise (gag). 2) 'Peach cobbler' which was flour, peaches, and syrup. 3) Fried chicken cooked long enough to burn it completely. 4) Salt was the only seasoning she ever used. 5) Spaghetti. No flavor...just ground beef (never drained btw), generic pasta sauce, and noodles. She got mad when I started using barbecue sauce to mask the nasty stuff she made. Man, I put it in mashed potatoes, macaroni, rice, and meat." "Growing up, my dad fixed us kids breakfast before school. Chipped beef and gravy on toast. If you were ever in the military, it is fondly called 'crap on a shingle.' Very true description. You either ate that crap or you went to school hungry. If you waved a hundred dollar bill in my face to eat that awful stuff, I would tell you where you could shove that bill. Turns my stomach to even think bout it." "Noodles and eggs. My mom would just boil egg noodles and then scramble some eggs and toss them together. She would make it constantly, ignoring the fact that I hate eggs."